Today we learnt the sad news that screen legend Sir Christopher Lee has died at the age of 93. Lee made a huge mark on cinema across his seventy year career, gaining fans from all quarters. Horror lovers adore him for his seminal performances as Count Dracula, Frankenstein’s Monster and the Mummy. Sci-fi aficionados love him for being Count Dooku in the Star Wars prequels and fantasy anoraks have him to thank for bringing Saruman to life in the Middle Earth series. But us Sherlockians should remember him too as the actor left an indelible impression on the way Sherlock Holmes is adapted to screen. Here’s a look at Lee’s forays into the Holmesian. 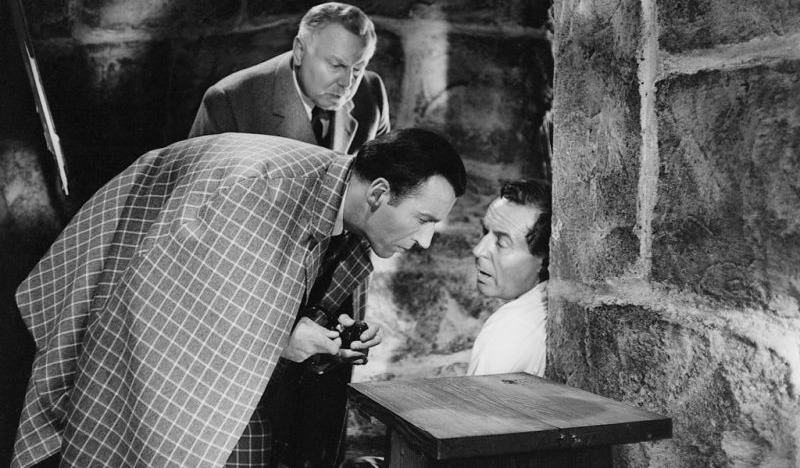 In 1962 Lee got a promotion from Baskerville to Holmes himself in this loose adaptation of the Conan Doyle novel The Valley of Fear which sees the detective going up against Professor Moriarty – who else? – to reclaim a priceless necklace worn by Cleopatra. 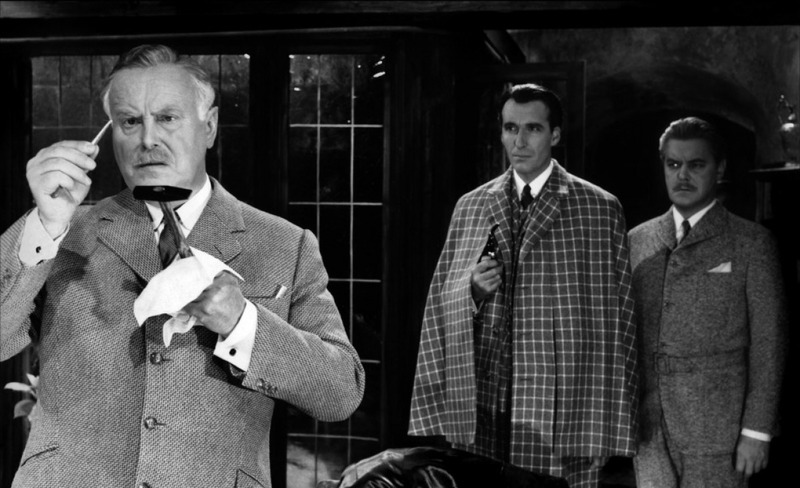 While Lee himself was not pleased with the finished film, his Holmes is certainly the best thing about it – absolutely nailing the look and mannerisms of the character. 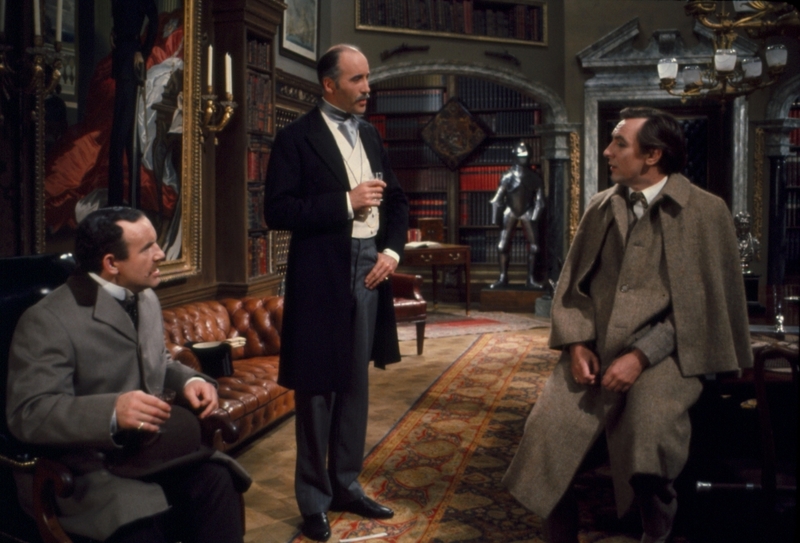 Despite the stellar work of Robert Stephens and Colin Blakely as the detective and his good doctor, possibly the standout performance of this seminal Sherlock Holmes film is Christopher Lee’s turn as Mycroft. Far removed from Doyle’s corpulent and avuncular character, Lee’s Mycroft is rakishly thin and has a severe sibling rivalry with Sherlock. Mark Gatiss and Steven Moffat have said how Private Life is their favourite Holmes film and credit Lee’s Mycroft as being a huge inspiration for the version seen in Sherlock. Much later on from his previous turn as Holmes, Lee returned to the character for a pair of TV movies subtitled Sherlock Holmes: The Golden Years. 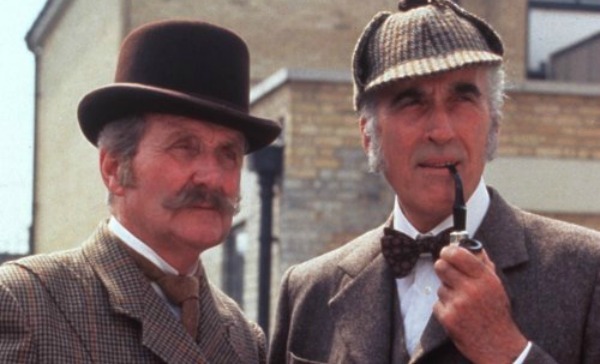 These films saw an elderly Holmes and Watson (played by Patrick McNee) on their last cases, involving a rematch with Irene ‘The Woman’ Adler and a globe-hunting quest for a stolen jewel. 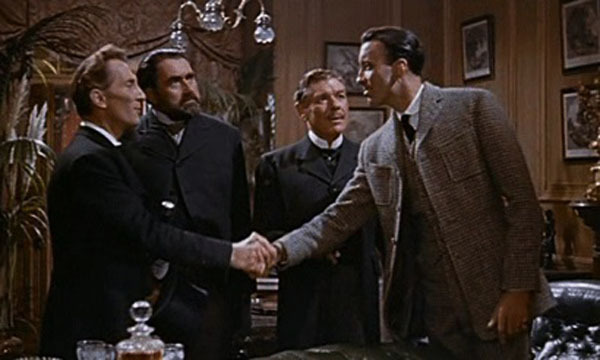 Despite being much older, Lee still captures the soul of Holmes and strikes up a memorable rapport with McNee’s Watson. So while Lee’s Holmes might not be as iconic as Jeremy Brett‘s or Basil Rathbone’s, he was definitely one of the Sherlock Holmes actors to understand the character most and his work as Mycroft helped shape our beloved Sherlock. For that we have to thank him. Rest in Peace, Sir Christopher.